It seems that ever since the new television program Who Do You Think You Are? began airing in the United States, activity and queries at our Bassett website have picked up. This new American television program was adapted from the award winning hit British television documentary series. It currently airs on Friday evenings in the United States. I want to once again thank Glenda for her hard work entering Bassett material from records into the website database. 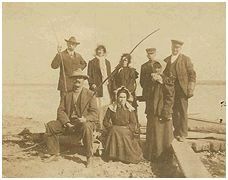 We have now loaded the first 8 generations of the #1A William Bassett of Plymouth family (who arrived on the Fortune in 1621) into the database. Work continues on generation 9 which is the largest generation and then generations 10 through 14 get increasingly smaller. Hopefully we can finish this complete tree before the end of 2010 and begin working on the #1B John Bassett and #6B William Bassett of Connecticut families next. We are still waiting for DNA results for the Bassetts of Tewkesbury, England. I still have funds available for three DNA tests for lines not yet represented in the Bassett DNA project. I would be especially happy to locate any Bassett line with roots in France, a Bassett from one of the Lincolnshire famlies. Testing is simple and done via the mail. I have received multiple donations over the past two months and would like to use them to document families not yet covered in the DNA study. Charles Henry Bassett (b. 1827) and wife Susan Bryant. Elforest Green Bassett, son of Charles Henry and Susan (Bryant) Bassett, was born 26 Aug 1865 in Livermore, Androscoggin County, Maine. He died 20 Dec 1945 in Auburn, Androscoggin County, Maine. He married Mary Elizabeth Harlow on 27 Nov 1890 in Peru, Oxford County, Maine. 68354121. Fred Harlow Bassett - born 25 Dec 1894 (WWI), married Hazel Velma Hutchinson on 24 Jun 1913 in Canton, Oxford, Maine. The Farm at Worthley Pond is a remodeled 1850 farm, located on 5 acres, nestled in a beautiful mountain valley surrounded by rolling hills. Located on a sparkling clear lake with a private beach only 125 yards from the Farm that is perfect for all season recreation. Only 40 miles from the Appalachian Trail and the large peaks of the White Mountains, these foot hills offer both beauty and day hiking. It is perfect for vacations, wedding receptions and family reunions. It is also an ideal setting for small group meetings such as staff retreats, board strategic planning, faculty curriculum planning, grant writing and sales group planning. Located just three hours north of Boston's Logan Airport near Bethel, Maine, the year-round facility offers a secluded mountain setting. The Farm can accommodate wedding parties as large as 100 in-doors and 300 out-doors. To read more about this rental property, click on the link below. 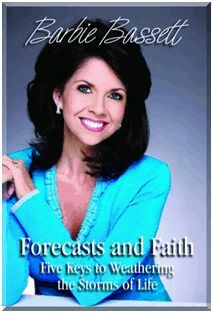 There is a new book available written by Barbie Bassett, WLBT Channel 3 chief meteorologist (Jackson, TN) called "Forecasts and Faith, Five Keys to Weathering the Storms of Life". In Forecasts and Faith: Five Keys to Weathering the Storms of Life, WLBT-3 chief meteorologist Barbie Bassett takes you behind the cameras for not only an intimate look at the fast-paced, high-pressure world of broadcast news and meteorology, but also the life of a true Mississippi survivor whose faith has kept her steady through every storm life has brought her. From the earliest days of her humble beginnings in the small Mississippi Delta town of Marks, Barbie's strong faith has given her a rock-solid foundation and supported her through not only the births of her three beautiful children, but through the tragic loss of a child...through her vastly successful decade at highly rated WLBT, and the anger, hurt, and confusion she felt during her year in broadcast exile...and through the weather-related storms she's lived through in her personal life: the deadly tornado that ripped through her Madison, Mississippi, neighborhood in 2001 and the far-reaching destruction of Hurricane Katrina in 2005. Through it all, you'll get to know a strong, intelligent, devout lady who was taught to give back in her youth and is passing those ideals along to her children while setting a sterling example for her community. To read more about Barbie Bassett, click on the link below. 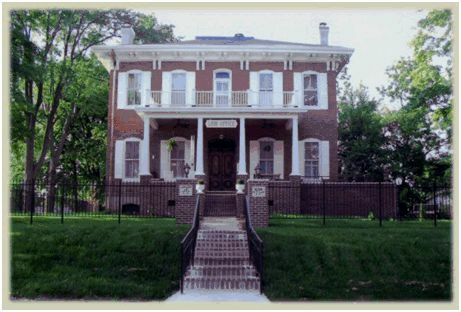 Now the home of Lawinger Law Office, Vandalia, Illinois, reprinted with their permission. I have not yet identified this Isaac Bassett. Below is his record from the 1850 census of Avoca, New York. A Bath dispatch to the New York Sun gives the following interesting story; “Isaac Bassett, a widower of Avoca, N.Y., aged seventy-two years, has just procured a wife through a matrimonial agent. The bride is Mrs. Lydia A. Gage, a widow, aged sixty-eight, of Hornellsville, N.Y. A few weeks ago Lewis H. Wagner told Bassett that he ought to get married, that he was getting gold and feeble, and, being without near relatives, should have some one to look after his property. The old gentleman readily fell in with the idea. The next question was to procure a bride. Wagner proposed to furnish Bassett a wife for $300. Bassett accepted the offer, and Wagner went to Hornellsville. In that city he laid his scheme before Andrew Eveland, and Capt. D.A. Signor, who introduced him to several elderly women matrimonially inclined. It was understood by the women that Wagner’s connection with the affair was simply that of a benevolent friend toward “Uncle” Bassett. An informal party was arranged at Hornellsville on the 19th inst., at which Bassett met the several candidates. The charms and graces of Mrs. Gage and the persuasive eloquence of Wagner completely captivated Bassett. He immediately proposed, and being all that he was represented to be, a refusal was out of the question. The wedding was set for Monday, the 20th inst. In the mean time a deed was made by Bassett converting all his real estate in Avoca, to the future Mrs. Bassett. The consideration was $1, and on condition that she would marry the grantor and ever after live with him and support and care for him. A mortgage was also made upon a part of this property, payable to Andrew Eveland, for $600. This was for security of a note supposed to have been given in satisfaction for the services rendered by Wagner and his assistants, as was agreed upon, the marriage was celebrated in Hornellsville on Monday and on Tuesday Mr. and Mrs. Bassett took up their residence in Avoca. As soon as Bassett’s friends heard of Wagner’s connection with the transaction they concluded the bridgegroonm had been victimized. Accordingly, Superintendent of the Poor Richtmeyer, through his attorney, conveyed a commission in lunacy to inquire into the old man’s mental condition, and the above facts were brought out. The attorney for Mrs. Bassett said that she was a woman of property in her own right and that her friends felt as much aggrieved over the marriage as did his. Taking this view of the case the commission was adjourned until May 5 without action. Just as the parties were leaving the court room Wagner was arrested on the charge of misappropriating a note. Bail was fixed at $700, which was furnished. He was immediately arrested, however, on the charge of stealing Bassett’s watch. On the second charge bail was fixed at $1,000, which he could not procure, and consequently the successful matrimonial agent languishes in the county jail in Bath where he awaits the action of the grand jury. Avoca, Sept. 1 – Isaac Bassett, an old resident of this village and almost 80 years old, while on his way home about 9 o’clock last night, was struck by Erie train No. 112 on the Grant street crossing. When found he was lying on his back on the side of the track almost 20 feet from the crossing. He died almost two hours later. George Bassett, the oldest male resident of the town of Salina and the oldest man who ever was a member of the Board of Supervisors, died at Liverpool Wednesday afternoon, aged 92 years. Mr. Bassett was born Jan. 9, 1817 in Wayne county, New York, but has lived in Liverpool since 1836, 73 years. On Sept. 19, 1849, nearly 60 years ago, Mr. Bassett married Hannah Adams at Fabins, who survives him. Mr. Bassett was a staunch Republican, and served on the Board of Supervisors first in 1857, He was re-elected in 1877 and 1878, and was one of the best known citizens of the section for many years. Mr. Bassett was a salt manufacturer for a long time, but later became a cigar manufacturer. He retired from business about 20 years ago, but had always been in good health until recently. He retained all of his facilities up to the last. 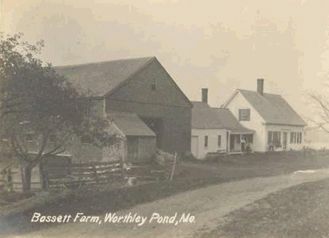 Besides his widow, Mr. Bassett leaves one son, Henry L. Bassett, and three grandchildren, Wilma Bassett, George Bassett and Fred Bassett. The funeral will be held at 2 p.m. tomorrow from his late home at Liverpool. 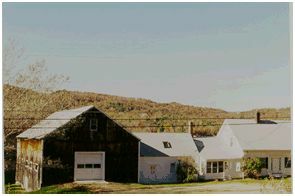 A picture of the "Bassett House" in Liverpool, New York was originally featured in the January 2005 newsletter. You can see this picture by clicking on the link below. Results are back for several kits for Bassetts descended from William Bassett of Plymouth, Massachusetts. They matched to other William Bassett descendants as expected and their results have been added to the DNA spreadsheet. A descendant of Philo Bassett of New York and Boone County, Illinois has joined the DNA project as has a Bassett from Tewkesbury, England. We also had two more William Bassett of Plymouth, Massachusetts descendants joins this month as well.